Undaunted, undefeated. 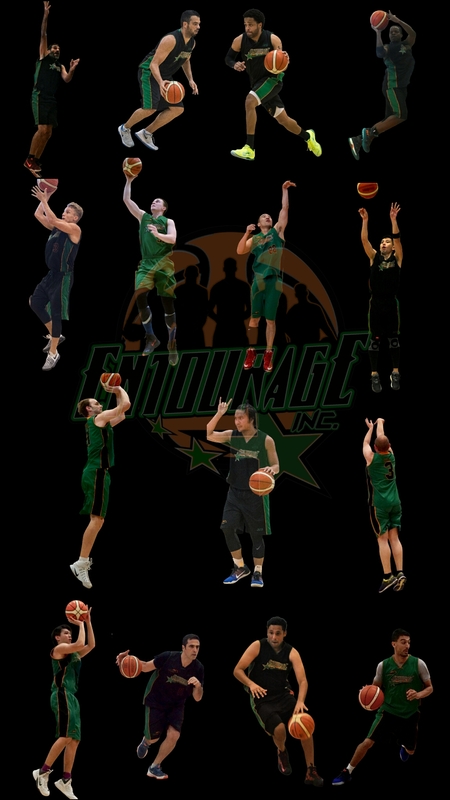 | ENTOURAGE BASKETBALL INC.
EntourageBBall-Midweek team puts a neat bow on a fantastic 2018 by blowing out Team Schoolers in the penultimate regular season game of the Fall season. The team achieved multiple milestones with the victory: an intact 23-Game win streak, finishing the calendar year without a loss, unprecedented in the 11-Year history of Entourage Basketball Inc., and a very real opportunity to repeat as FastBreak League champions. Things were not looking too good, heading into the final game of 2018. A full complement of 12 players had earlier committed to playing against second place team Schoolers, but as gameday drew closer, the numbers shrank down to just seven available players. E.B.I-Midweek had to draw on a pair of 40-Year old veteran reserves, Gery and Dave, to secure a rotation. Probably due to the Mid-December date, Team Schoolers were also short a few players, showing up with 7 to face the eight-man E.B.I. squad. A close opening quarter led to a 17-all tie after ten minutes. Then the men-in-green turned up the defense. Close 1st quarter, followed by excellent defense. Anchored by center and team captain, Jean Baptiste, the team swarmed allover their opponent, forcing turnovers and converting in transition. Conceding just 12 points in the middle quarters, while scoring 44(! ), safely put the game away as the fourth quarter rolled around. Torrid long-range shooting (12-27 from the arc) and unselfish ball-sharing led to big scoring runs. JB, who had a spectacular game with 12 Points, 25(!) rebounds, 3 blocks and 2 steals, could count on veteran guard Jerel (25 points, five 3’s) to shoulder the load on offense, but the entire group played excellent team Basketball: 25 assists to Schoolers 12 underscore that. The win keeps the reigning FastBreak Men’s League champs at the top of the standings, while also demonstrating to the rest of the league that E.B.I still very much is the team to beat come playoff time late January.